This is Sinatra's 12th Album with Capitol. Next Come Dance With Me! I have known this recording for 50 years. I also have the MFSL mono edition from 2009 and in my opinion, this is a superior, quieter pressing. I can hear more on this version, pure and simple. I know the mono edition has many followers (ditto "Where Are You?" 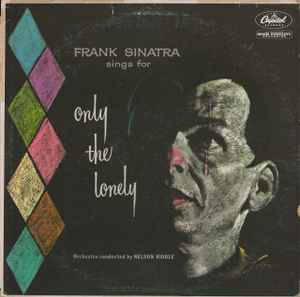 from 1957, which was Frank's very first album recorded in stereo - it would be great to have that given the same treatment as this) but so many of even the *very* early Capitol stereo recordings (1956-1958) are superb. Listen to some of the Stan Kenton's from the same period. Three tracks, and probably as many microphone's, likely centre / 2nd track for Frank's vocal. Beautiful. BTW - despite comments below, the cover art won a Grammy. Probably the peak of Frank's career "artistically", and he may well have agreed, rating it very highly himself. As others have already stated the mastering and pressing are truly great. I already owned a different version of the album and am happy that I purchased this new version. The sound is clear, spacious and rich. However, the packaging is disappointing: the white borders destroy the iconic cover, the download code doesn't work (at least for me) and the inner sleeves look like ads for other Sinatra records. A high fidelity record like this one should come in antistatic/polylined inner sleeves instead of thick paper sleeves. By any standard, metric, or subject, this is a wonderful mastering and pressing. I can’t say much more than that beyond there is simply nothing between yourself and some of the best music ever put to wax. j'ai une version de 1958 stéréo avec les références "Music For Pleasure ‎– 4-M024-81966, Capitol Records ‎– 4-M024-81966" et la playlist de la version de 1977. Je ne la trouve pas dois je le rajouter comme référence ? That is not a 1958 version of the Frank Sinatra LP. Capitol changed from the black, colourband, 9 o'clock logo label in 1962, moving the logo to the 12 o'clock position. This is such a treat... Unbelievable sound, especially for anyone who's heard the awful repress that were done 2 years ago and which sounded so thin and poor. But this is incredible. I have some of the MFSL Sinatra repress, and I have to say this reissue is close to them. His voice is not as rich, but the Orchestrations on this pressing are unbelievable large). Absolutely quiet pressing on top of it. -why not press it at 45rpm since it's a double, the sound would have been even better? -how amazing would it be the get also the mono repress like that? In any case... I would only recommend to get it! Spot on ratskins. I thought it was some sort of "special" new cover for the new deluxe release, then discovered that's how it was originally!! The songs may be fine, but this certainly should be on a list of worst album covers in history. Although, John Wayne Gacy might like it. My copy has side two label on both sides? Is it common on this pressing? Sinatra's "goth" album. A real treat for depressives and introverts.